Ann lectures Marketing at the J. E. Cairnes School of Business & Economics, NUI Galway on the MSc Marketing Practice. She is also responsible for mentoring marketing masters students in paid placements as part of this programme. Ann has worked extensively with SMEs in the West of Ireland, as a Marketing & Business Development Consultant over the years. Starting out in The Irish Trade Board (now Enterprise Ireland), she went on to work as an account executive with a leading graphic design and multi-media company. From there Ann worked as Marketing Manager for Infopoint Systems Irl. Ltd (interactive touchscreen technology) and then EMEA Marketing Communications Manager and then EMEA Product Manager for Herbalife Europe Ltd., a multinational publicly quoted company in the health and personal care industry. 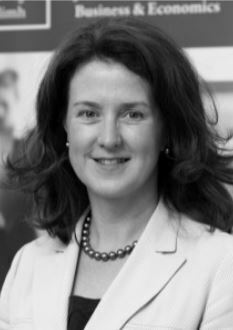 When she returned to Ireland, Ann worked in marketing in the hospitality sector before joining the Marketing Discipline at NUI Galway. Marketing research: target market, competitor analysis, industry analysis. Setting SMART objectives (Specific, Measureable, Achievable, Realistic and Timely).